After washing the baingan thoroughly pat dry them with kitchen cloth. Cut the baingan stems and make two cuts cross wise for filling. In a bowl add salt, red chili powder, turmeric, amchoor, coriander, cumin powder and mix it well with spoon. Now fill in all the baingans with the masala and keep them aside for 30 minutes at least. In the mean time in a non stick pan add 1 tbsp of oil and add onions to it. When the onions are caramelized take it out from the pan. In the same pan add all the baingans carefully with 2 tbsp of oil. Fry them until turned soft and changed color. Now place the onions in serving bowl and then add the baingans on the bed of onions. Hey, Guys. I do not think there is any point in carrying the discussion too far.Vicky, please cool down and stop writing such bad comments. If you think, its bakwas, its your opinion whcih doesnt mean that you have to voice it all over the world. Do you have any personal discrepancy with Chitra? please Chita darling don not tell me you do not have jealousy in you!!!!!!! I see most of you on here jealous of each other, that even after liking a recipe of someone you do not give votes to each other. and vote for your self from 11 different accounts. Come on, people before you have posted similar recipes but never got so many votes, those with logic here understand exactly what you are doing." khud he recipe do or khud he vote, bil kul Indian politicians ke tara". Thanks you all for your wonderfull support. I dont get discouraged with any comments, actually it keeps me going . Somebody once said "With Success comes Jealousy". Anyways I am here to learn and share my knowledge. Love you all. 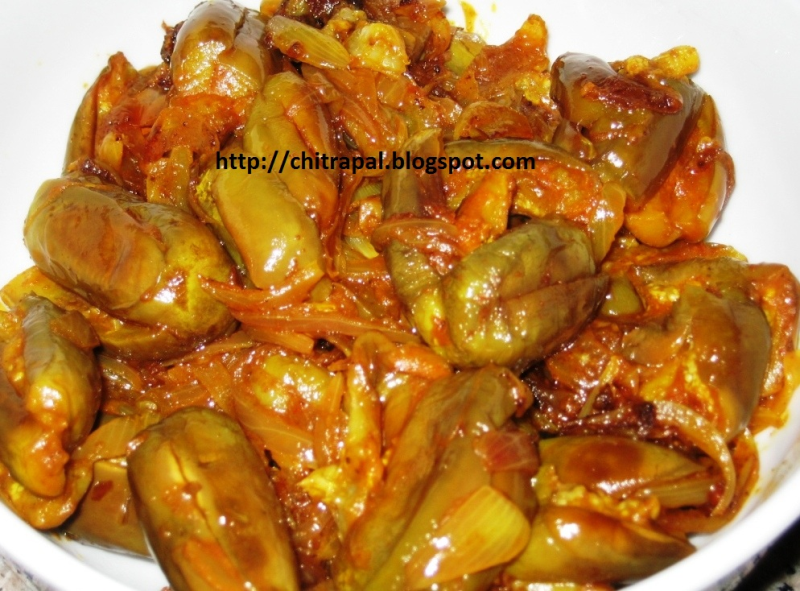 Thanks Chitra, I just love eggplants and have you tried this with "Anaardana", it will come really good. Anyways, its really delicious and keep it up. You should not listen to guys like Vicky, he has no other job, I feel sorry for him. Vicky sahab we should appreciate our women for giving out recipes even if some of us don not like it as many women today do not even know the ABC of cooking. Shweta jee apun ko gosa nahe ata pur apun Injustice nahe digest kur sukta hay. App khud daykh lo popular list may inka ketna recipe hay. Bhay dosron ko bhe chance dena cha yaya, key khayal hay??? Pyaare Vicky ko ghussa kyon aataa hai??????? So how many votes are you going to give your self from different accounts for this "BAKWAS" recipe?